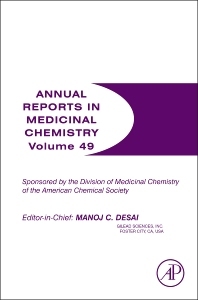 Annual Reports in Medicinal Chemistry provides timely and critical reviews of important topics in medicinal chemistry with an emphasis on emerging topics in the biological sciences that are expected to provide the basis for entirely new future therapies. Dr. Manoj Desai began his career in the pharmaceutical industry at Pfizer Inc, Central Research Division, Groton, CT (1986-1994) before moving to Chiron Corporation (1994-2003) as Director of medicinal chemistry; he was promoted to Vice President, lead discovery and medicinal chemistry (2000). In October 2003, he was appointed Vice President of medicinal chemistry at Gilead Sciences. At Pfizer, he was responsible for the medicinal chemistry efforts that lead to the discovery of oral Substance P antagonist CP-99994 which became the basis for the discovery of the new anti-emetics. At Chiron he formulated macrobead technology for the synthesis and screening of compound libraries for HTS and built the medicinal chemistry department with focus on kinase inhibitors. At Gilead, he was an active proponent to develop a pharmacoenhancer devoid of antiviral activity to improve the pharmacokinetics of integrase inhibitor elvitegravir. These efforts led to the discovery of Cobicistat which is one of components of StribildTM that was approved by FDA in August 2012 for the treatment of HIV infection. He is co-inventor on patents of Cobicistat (US 8,148,374), StribildTM and Ledipasvir (US 8,273,341; Phase III). Furthermore, his group at Gilead has advanced numerous compounds into clinical development for the treatment of antiviral diseases, cancer and cardiovascular diseases. Dr. Desai obtained Ph.D. in organic chemistry from the M.S. University of Baroda in 1981 working with Dr. Sukh Dev and then carried out post-doctoral fellowships at Purdue University working with Professor Herbert C. Brown (19981-1983) and at Harvard University with Professor Elias J. Corey (1983-1986). During his postdoctoral studies, he worked on natural product isolation, development of asymmetric synthetic methods using organoboranes and total synthesis of complex natural products such as retigeranic acid, -trans bergamotene and ginkgolide B. He has co-authored >60 publications in peer reviewed journals and is an inventor on >25 issued patents. Furthermore, Dr. Desai is Editor-in-Chief for Annual Reports in Medicinal chemistry (2012-current), and have co-edited Comprehensive Medicinal Chemistry II (volume 7). In 2013, he co-edited book titled “Successful Strategies for the Discovery of Antiviral Drugs”.